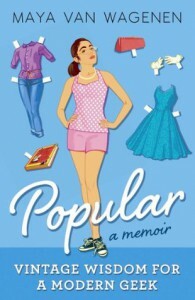 Popular is the memoir, yes I said memoir, of then-13-year-old Maya Van Wagenen, who finds a copy of Betty Cornell's Teen-Age Guide to Popularityfrom the 1950s in her father's study and decides to embark on a year-long social experiment where she follows the advice of Betty Cornell, teen model in the 1950s. This includes dramatically changing the way she walks, the way she dresses (the addition of a girdle! ), experimenting with her hair and slowly drawing herself out of her shell to widen her circle of friends, something she never thought she would be able to do. Maya's voice is fresh and honest, and it is heartwarming to read her journey as she learns what is most important on her quest for popularity. Her whole world opens up in an entirely different way when she steps out of her comfort zone and not only does she learn about herself, she also learns about her classmates and that, social ranking or not, they are really all the same. I admire Maya's bravery and I enjoyed the writing, and I look forward to what she does next. I'd always thought they were mean and judgmental, but I guess I was the one judging before I really got to know them. Why is everyone so scared of one another?